In the conditions of a fast developing market and severe competition, our mission is to protect the interest of owners of trademarks and users of geographical indications in Bulgaria in the best possible way. Some of the Association aims are to encourage, support and represent the common interests of its members and to protect and represent them in front of state and public institutions in Bulgaria and abroad. Having in mind that the formation of trademark politics is a hard and wide-ranging process, we aim to join the forces of those who are interested and the relevant institutions. In this way we help for the good co-operation in accomplishing the trademark politics. We are glad to encourage science and practical elaborations and researches in the field of trademarks. Plamen Velikov has been the executive director of the fast developing Bulgarian company for lacquer- dyer’s materials – Megachim AD since its foundation in 1996. His professional goals are to provide high standard and perfect working conditions for his employees and partners, to gain the trust and satisfaction of his clients. Aglika Ivanova graduated Law in University of National and World Economy and later specialized in the Intellectual Property Department of the Technical University of Sofia. Mrs.Ivanova is a member of International Bar Association. Her areas of practice are Intellectual Property Law, Copyright Law, Competition Law, Licensing, Contract Law, Franchising, Media Law, Litigation, Commercial and Corporate Law. Rumyana Vassileva has a master’s degree in Macroeconomics from Plovdiv University “Paisii Hilendarski”. 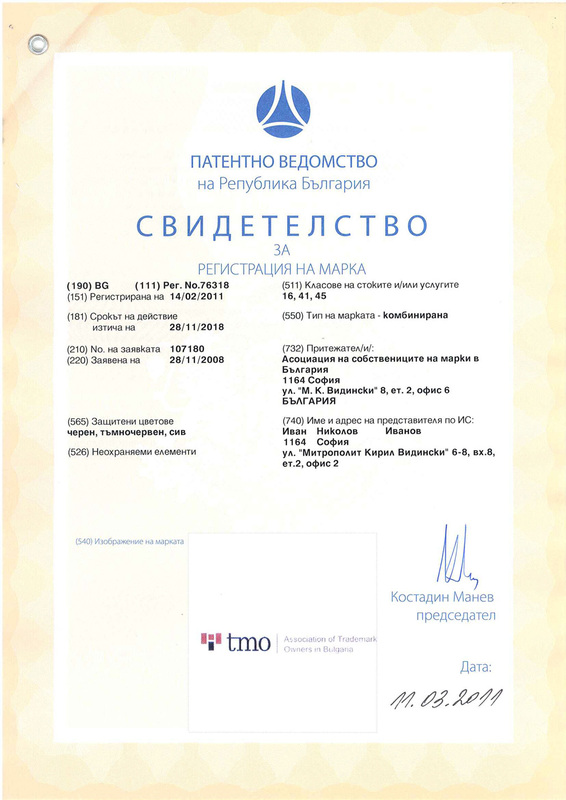 Later she specialized “Legal protection of intellectual property” in Technical University-Sofia, branch – Plovdiv.